This week, ASUS is announcing two graphics card which include the GeForce GTX 980 20th Anniversary Gold Edition and the GeForce GTX 970 Turbo. We detailed the Gold Edition graphics card yesterday however, the GeForce GTX 970 Turbo got by unnoticed and Videocardz managed to catch the second announcement that comes with a white colored shroud. 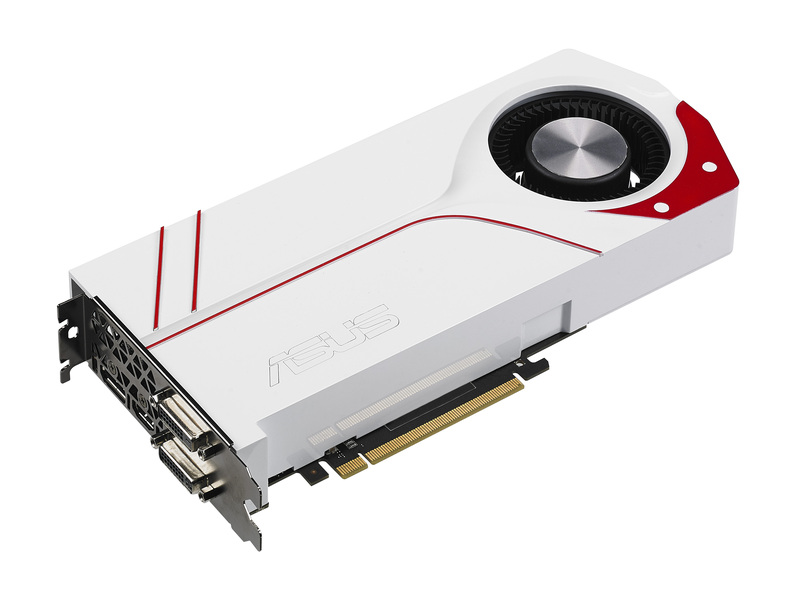 There’s nothing special about the GeForce GTX 970 Turbo since it has a custom PCB hidden beneath a new cooler which ASUS has introduced to celebrate their 20th Anniversary of being a graphics card maker. ASUS’s GeForce GTX 970 comes with the standard specifications we should expect from a reference GM204-200-A1 die that includes 1664 CUDA Cores, 112 texture mapping units and 56 raster operation units as per the latest specifications which we unveiled after the VRAM fiasco which hit the GeForce GTX 970 cards in early 2015. The card still packs a 4 GB GDDR5 VRAM running across a 256-bit interface which is cut into two partitions as the Maxwell core architecture on the 970 is adjusted. The clock speeds for the GeForce GTX 970 Turbo are running at 1088 MHz base, 1228 MHz boost and the standard 7008 MHz (7.0 GHz effective) memory frequency which pumps out 224.0 GB/s bandwidth. ASUS has done a few things special with the design of the card. It comes with a full white shroud which is unlike the reference design and has strikes of red which kind of gives a ASUS ROG impression. The shroud looks bulky and comes with a blower type cooler which pushes heat out of the front I/O exhaust panel. ASUS has not given the card a reference I/O display configuration that is found on Maxwell and went with a Dual-DVI, HDMI and single Display port layout. Card is powered by a 6 and 8-Pin connector and SLI connectivity includes 2 gold fingers which allow Quad-Way SLI multi-GPU functionality. Just like the GeForce GTX 980 Gold Edition, ASUS didn’t reveal the pricing or availability date of their new GeForce GTX 970 Turbo but it should be expected to hit a premium over the standard MSRP of GTX 970 that is $329 US.